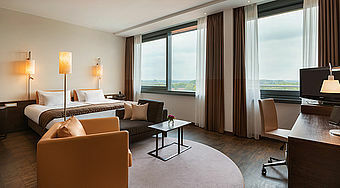 The INFINITY Hotel & Conference Resort Munich in Unterschleißheim is the largest hotel and conference centre on Munich’s north end. It is also the top choice for conventions and events. 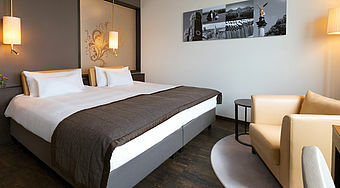 Located just outside Munich, it boasts optimum connections to the city centre and airport alike. 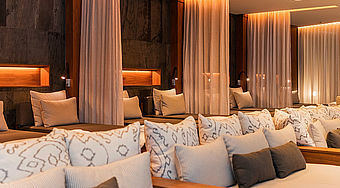 We offer you a one-of-a-kind hideaway for events, private parties or a relaxing couples’ retreat. Our rooms and suites bring together a wide range of individual expectations to create a harmonic symphony of everything our guests demand: Cosiness paired with style, elegance and sophisticated comforts as well as access to the finer things of life. 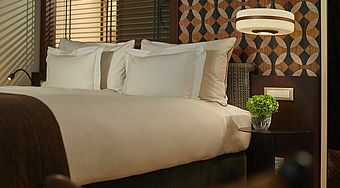 Your light-flooded superior room in natural hues will pamper your senses with its modern design and beautiful comforts. 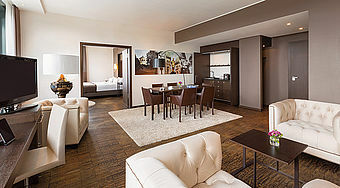 Among the amenities: LCD flat screen TV, laptop safe and complimentary high speed Internet access. 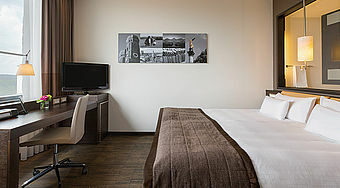 We invite you to relax under the rain showerhead and on the super comfortable queen-sized bed. If you are staying in one of our junior suites, you will enjoy a luxurious ambiance in a particularly generously appointed space. Our presidential suites, on the other hand, offer the ultimate in privacy: all of them have their own balconies and some even have an in-room sauna. 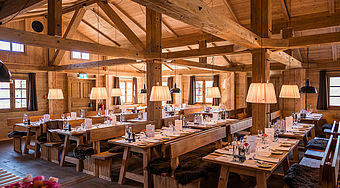 Treat your palate to scrumptious specialties – enjoy a balanced breakfast at the Viktualien Restaurant or a delectable hearty Sunday brunch at our Hirschalm. 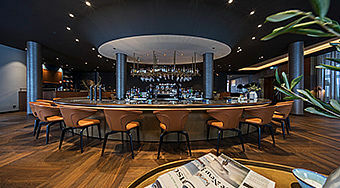 Experience a touch of French cuisine at our Le Bistro or choose from the fine dining menu at the Redox Restaurant followed by a "Signature Cocktail" at our Bar. The occasion and your preferences will help you decide – our culinary team will create everything your heart desires for you – from break time snacks to catered events to traditional Bavarian cuisine to sophisticated multi-course "à-la-carte" meals. Whenever possible, we use local or regional ingredients and will surprise you with novel creations and inspirations. will begin with a perfect meal. 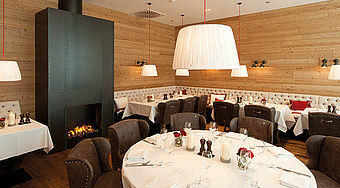 accommodates up to 45 guests. authentic flair your heart desires. Guests like you know best what it takes to make you feel your very best. We will do whatever it takes to optimally accommodate your needs. 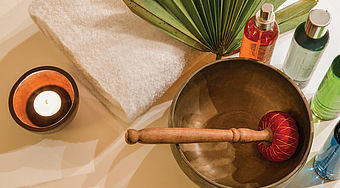 Our INFINITY SPA treatments and packages are part of this endeavour of providing the best possible resources to bring body, mind and spirit into perfect harmony. 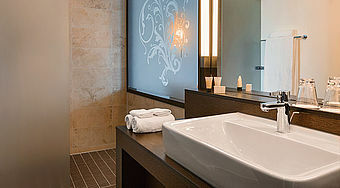 Enjoy the large pool, different types of saunas, steam room and exercise equipment. 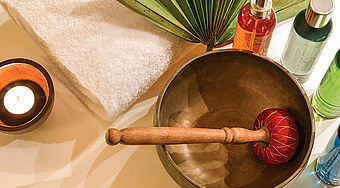 Of course we also offer a wide range of spa treatments – such as revitalising massages and relaxing body packs. If you like to work out, you will be pleased with the ultra-modern exercise equipment available in our fitness area, so that you can further boost your personal fitness level. 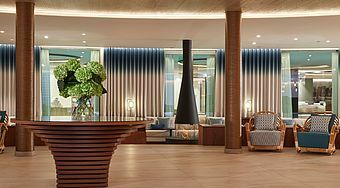 If you are not a hotel guest (yet), a wellness day at our Day SPA near Munich is your best option for a mini break. 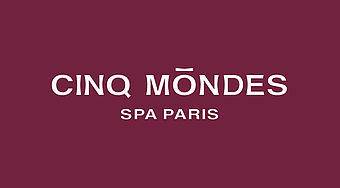 We will be pleased to offer you an all-day SPA ticket. mind, body and soul balance. – created just for you by our team.